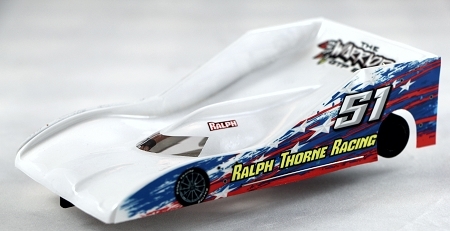 Home > Bodies > Warrior GTP Body .005"
Ralph Thorne Racing proudly presents 'The Warrior,' a new 1/24 GTP body that we are manufacturing in-house. This body is an original copyrighted design that was CAD-designed with input from top racers around the country. Its many features compliment modern-day flexi cars with a unique blend of improved handling and increased straightline speed. These are quality pulls with even side thickness. The new body also features a cut line to assist in body trimming. Each body comes with a window mask and a pair of front wheel stickers. If you purchase five or more bodies at retail price, an extra body will be included with your order as a thank-you! Titan COT Stock Car Body .005"
Titan Stock Car Body .005"
Titan Stock Car Body .007"